My first piece for this magazine was a short profile of Michigan Governor Rick Snyder in the spring of 2011. 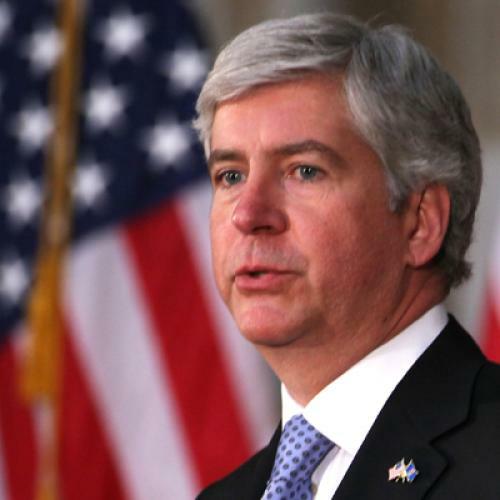 At the time, Snyder was presenting himself as a stark contrast to the more ideological newly elected Republican governors. Unlike Wisconsin’s Scott Walker, Ohio’s John Kasich and Florida’s Rick Scott, Snyder was glad to accept federal funding for passenger rail upgrades in his state; he instructed his administration to start implementing Obamacare, resisted cutting Medicaid and defended embryonic stem-cell research; and, perhaps most notably, steered clear of the harsh anti-union rhetoric gaining steam in other states, saying he had no interest in pushing explicitly anti-union legislation as his counterparts in Ohio and Wisconsin were. Michigan needed to repair its “broken culture” by “overcoming divisiveness and getting [back] to inclusiveness,” he said in a speech I watched him give in downtown Detroit. As the back story has it, Snyder’s forbearance toward unions had worn out over their successful push to overturn by referendum his emergency-manager law (which allows for municipal union contracts to be broken) and unsuccessful push to enshrine collective bargaining rights in the state constitution. And he was facing huge pressure from the right -- not only from the Republican-led legislature, but from major conservative funders like the DeVos clan of Grand Rapids, the founders of Amway. But Snyder’s press conference announcing his shift was a classic moment in sugar-coating -- he layered on the pro-union rhetoric and offered a seemingly practical, bottom-line rationale: that Michigan risked losing jobs to Indiana, which became right-to-work last year. Of the 10 states with the highest per-capita incomes, for example, only one is a right-to-work state, and just three of the top 20 are. On average, right-to-work states have per-capita incomes that trail union states by more than $5,000. Right-to-work advocates always claim their states are creating more jobs than union states — which holds some truth, if you just look at the sheer number of jobs created. But of the 11 states with the fastest-growing economies as measured by gross domestic product, only three were right-to-work states in 2011. (Michigan was on that list in 2011, too, which Snyder spent all year this year bragging about. Now, suddenly, he claims our economy is being hobbled by an oppressive union environment.) As a result, right-to-work states also suffer much worse poverty than union states, by several important measures. Eight of the 10 states with the lowest overall per-capita incomes are right-to-work. And among the states with the highest rates of people without medical insurance (a sign of the quality of jobs available), seven of 10 are right-to-work. Eight of the 10 states with the highest poverty rates are right-to-work. Why would Michigan want to emulate those states? Good question, but the state apparently is going to emulate them, and it’s going to be hard to undo. Legislators cleverly attached the legislation to an appropriations bill so that it could not be overturned in referendum, as happened with the Ohio law Kasich signed last year that sharply restricted collective bargaining rights for public employees. The Michigan legislation also learned another lesson from Ohio: unlike Kasich’s law, but like Walker’s anti-union legislation in Wisconsin, it exempts police and fire unions. It’s all left Tim Burga, head of the Ohio AFL-CIO, shaking his head at what is being carried out to his state’s north, just a year after Ohio voters so resoundingly defeated Kasich’s law (which, by leaving private sector unions untouched, was arguably less radical than what Snyder is about to sign). “We had that great debate in Ohio, and this is potentially even broader than that,” Burga told me. “They’re looking to take not only the rights of public workers, but of auto workers and steelworkers and bricklayers. It’s unnecessary and it’s going to hurt the middle class and their economy.” And it’s not just the union types saying this anymore—even ardent free marketeers like Henry Blodget are worrying about what organized labor’s decline, to only 7 percent of private-sector workers, means for the country and economy. With a referendum foreclosed, the only way for Michigan to leave its new right-to-work brethren like Mississippi, Alabama and South Carolina will be for voters to toss out Snyder and the legislature’s Republican majorities in 2014 and elect Democrats who’ll repeal the law. But that will require Democratic voters to make a better showing than their anemic 2010 one**. It’s well and good for Barack Obama to have once again carried Mitt Romney’s home state this fall, but it did nothing to keep this step, a legacy of the 2010 wipe-out, from moving forward. 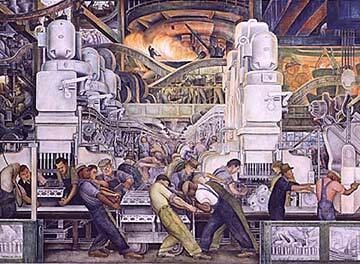 Michigan, birthplace of the UAW and home of the greatest piece of pro-worker art in the country, is about to become right-to-work. Midterms matter. A “good leader.” That’s one way of looking at it. *I added a couple lines here to emphasize the rushed, dark-of-night nature of the passage, which Ed Kilgore's item on the legislation reminded me of. **Several commenters online rightly remind me that it wasn't just low Democratic base turnout in a GOP-surge year that swept Snyder into office, but the misjudgment by many moderate voters -- including not a few who generally vote Democratic -- that he would govern as a Rockefeller Republican. It also didn't help that he was running against an underwhelming opponent, who helped drag legislative candidates down with him. And as Dave Weigel notes, the 2010 legislative wipe-out has put Michigan Democrats at a disadvantage for the whole decade, thanks to the magic of redistricting. All of which is to say that a reversal of this new law could be a long time coming.